strong, confident, and kind-their kindness was framed in courage. "What a delight! 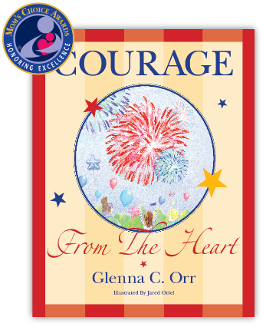 Glenna C. Orr’s book Courage from the Heart is a true story telling the experience of a Navy Nurse. At the age of 20 in the year 1943, I was sworn in the Marine Corps. I can relate to the story and the times. Also, Glenna expresses well the knowledge that can be shared between older and younger generations." -- Norma Rambow B.S.M.A.